“He’s been on flames,” was Danny Welbeck’s description for the scintillating form French forward Olivier Giroud has been in since the turn of the year, and he couldn’t have said it better. Giroud, now 28, has been criticized substantially in recent seasons by Arsenal fans and Premier League viewers alike for his lack of pace, and propensity to miss easy chances. Furthermore, many saw him as soft as a result of his size and the amount of times he went to ground and how he dealt with adversity. 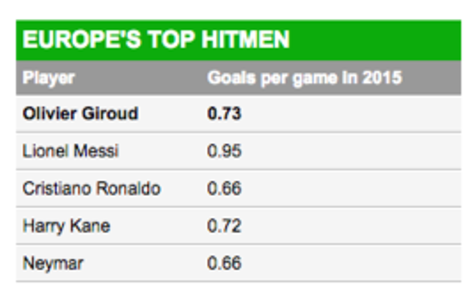 However, now that Giroud is banging in the goals he is starting to get some very overdue praise for his overall performances. Granted, Giroud is clearly a different player than he was at the end of last year, and even the beginning of this year, finding a newfound sense of drive and motivation coming back from injury and having to fight for his spot. 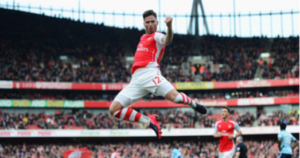 Yet, much of what Giroud is doing so well for Arsenal at the moment, he didn’t just start doing in 2015, he’s just added consistent goals to his game, causes teammates to get him more involved, and causing the opposition to respect him more, opening up space for Arsenal’s speedsters, resulting in 11 goals in 15 appearances for Giroud in 2015, absolutely lethal. He constantly gets his teammates involved, whether by making a darting run into space to open up room for Ozil or Sanchez to come inside, or by serving as a wall for the midfielders to play give and goes with. He contributes to the overall play of the team, in the thick of things in the final third offensively and defensively as well. Giroud plays as a true number 9 (granted, he’s number 12) he can play back to goal, in the air, on the break, and assist his teammates with regularity. Giroud provides an invaluable balance of team play and to a team whose attacking system revolves around the dangerous midfield running of Ramsey, Ozil and Sanchez. In particular, Giroud Ramsey and Ozil have developed fantastic chemistry dating back to Ozil’s first game in which he assisted Giroud, then to kill of the game at 3-1 Ozil and Giroud combined to find Ramsey for a delicate finish. This chemistry was evident yet again during the 3-0 win against West Ham this month for the first two goals. In comparison to the other striking options for the Gunners, no one can bring to the table (or pitch) what Giroud has to offer. While Welbeck is an above average striker, he is not strong enough in the air and is not nearly clinical enough, finishing only 8 goals through 26 matches, with a tendency to miss the easy chance. Similarly, Alexis Sanchez or Theo Walcott could be deployed up top, but they also would not provide any aerial presence. Moreover, while Sanchez Walcott and Welbeck all make darting runs in behind the defense, that takes space away for the wingers to run into and they don’t offer the same build up play as Giroud. Granted Sanchez is superior to Giroud in terms of technique, Giroud’s passing has a simplicity to it that Sanchez tends to dribble away from. Although there are certain aspects of Giroud’s game that are not world class, his overall contribution to the team should earn him that title should it continue the rest of the year. More importantly, Giroud success is the epitome of fighting against adversity and hard work, that mental toughness Arsenal had been lacking for years, isn’t just coming back into the midfield with Francis Coqlien but with Giroud up top. Not only has he dealt with endless criticism the past few seasons, but also this is a footballer that was playing in the French second division only five seasons ago. Clearly this is a striker brimming with confidence, something every manager loves to see. Finally, for those who may agree with my points but still refuse to label Giroud a world class or even clinical striker, or if you’re a Chelsea supporter, see below.